I immediately knew what I wanted to do to create a bourbon cocktail, although the end result was the amalgamation of a couple of iterations. Getting there wasn't easy, and be careful, this can get you a bit tilted, if you catch my meaning. My first thought was Krupnikas, an enticing concoction from a wonderful man named Rim Vilgalys, who runs a distillery in Durham, North Carolina. Villgalys makes Krupinkas, part of a unique line of Baltic-style spirits he infuses with all manner of herbs and spices, by hand, and which he boils in a two-hundred- gallon stainless-steel kettle, at one time the base for a still. 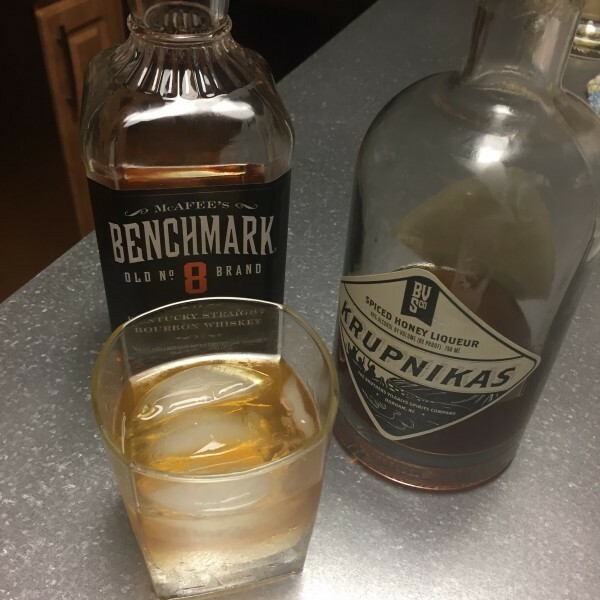 For this cocktail I started with Benchmark, a Buffalo Trace bourbon that's great in mixed drinks and quite OK with an ice cube or even straight up. I played a bit with lemon and bitters but found the Krupnikas — that honey and spiced liqueur — and the bourbon worked best, albeit with a pony of simple syrup. So, it's a jigger of bourbon and a pony of the liqueur and syrup. Garnish with a Marischino cherry and you're golden.